Datengut Baueakte and Perceptive DMS can be interconnected with officeGATE, which is an MS Outlook add-in used for collaborating on documents residing in different data management systems (DMS). officeGATE is a client application of contentACCESS, and it requires a contentACCESS user to sign in to the particular data management system that is interconnected with contentACCESS. To simplify this login process into these third party systems (DMS like Datengut, Perceptive), it is possible to automatically create a contentACCESS user from the particular provider’s configuration dialog, in contentACCESS Central Administration. 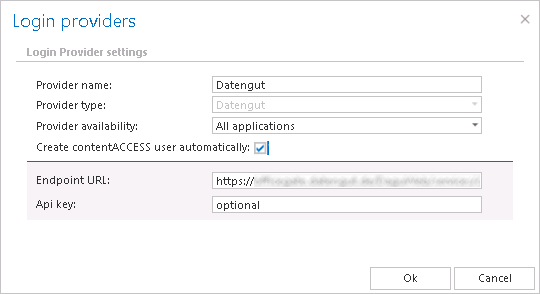 This ensures single sign on into the particular DMS providers in officeGATE..
To achieve this, check the “Create contentACCESS user automatically” checkbox (and fill the required credentials). When you are logging in to Datengut or Perceptive DMS in officeGATE with your personal account, the contentACCESS user will be created automatically at the moment of logging in. If the “Create contentACCESS user automatically” function is not enabled in the provider’s configuration dialog, then the administrator is forced to create contentACCESS users manually. Automated user creation helps to save much time for the administrator, as he does not need to create contentACCESS users for each user of the third party application (like Datengut or Perceptive).